If I’ve done my homework correctly, then today is the 2yr Birthday of that storied Open Wheel Racing Mergification ceremony hosted on SPEED TV, where Kevin “Smiley Face”Kalkhoven and Tony “I WON!” George announced the long overdue reunification of Open Wheel Racing in the US, after what is known as The Split came to an end after an acrimonious 12+ years as the frenzied Popperatzi’s flash bulbs continuously took pictures of Kevin and Tony shaking hands jubilantly. But it’s been a wild ‘N wooly two years since this ridiculously overdrawn affair occurred, (the merger) as I’ll leave Y’all to ponder if Open Wheel Racing is better off or worse today? Of the crumbling Champ Car World Series Dynasty, only a handful of Teams still exist in the Indy Car Series today, as Gerald Forsythe is nowhere to be seen, having left Mr. Chrome Horn, nee Paul Tracy High ‘N Dry… While Paul Gentilozzi is now busy trying to resurrect Jaguar’s Sports Car legacy with his RSR GT2 program. Kevin Kalkhoven along with partner Jimmy Vasser continue trying to mold KV Racing Technology into a front runner in IndyCar, with a revolving cast of Drivers, including The Thrill from the West Hill, (Paul Tracy) whose been moonlighting for them the past two seasons. Derrick Walker who planned to merge with the IRL seemingly got the Shaft when business partner Craig Gore took his Aussie Vineyards sponsorship and prized driver Will Power to KVRT instead, leaving the longtime CART, Champ Car and IRL Team Owner holding the Bag… As scuttlebutt now suggests that the venerable Scotsman may be trying to work a deal with Robby Gordon for a return to The Speedway this May? Eric Bachelart has been fighting gamely to stay afloat with his low-bucks conquest Racing Organization, as he continues to bravely field a lone single car entry with a cast of assorted racing drivers, having unfortunately bought brand new Panoz DP1’s just prior to the merger! Yet Bachelart plans to contest 2010 and hopefully Jan “Van Hagar” Heylan will be back in the seat for the fast approaching season? Or will it be “Moana Vye’s” Tomas Scheckter? Carl Russo and his upstart RuSport Racing Team have long since left the fight, with signature driver AJ Almendinger going’ south to pursue a Tin top career, first for Red Bull before some ex-F1 Piloto named Scott Speed replaced him, with AJ now racing for Richard Petty Motorsports. AJ’s teammate was a chap affectionately known here at No Fenders as Justin ‘BIG UNIT Wilson, who is one of only two Champ Car drivers to have won an event in Indy Car’s… Can you name the other? (He’s currently seeking a ride…) While the final Hotschue to drive for the amalgamation between Rocketsports Racing and RuSport, which became RSPORTS alongside Wilson, was ‘TAG, a.k.a. Alex Tagliani, who will now drive for the brand new FAZZT Race Team in 2010. Minardi Team USA, which was a combination of the plucky “Aussie” Paul Stoddart and veteran Champ Car Team Owner Keith Wiggins, who’d run the ex-Tony Bettenhausen Operation under multiple guises, including a stint with Cedric The Entertainer, ran a well oiled machine that saw Open Wheel upstart Bad Bobby D, a.k.a. Robert Doornbos to two wins, third in the overall standings and the series final rookie of the Year honours, as well as being one of the few drivers besides PT to get underneath The Hamburgular’s skin, while his teammate was the blazing fast, crash prone Dan “Speedy-Dry” Clarke. Dale Coyne, the proverbial Little Team that Could! 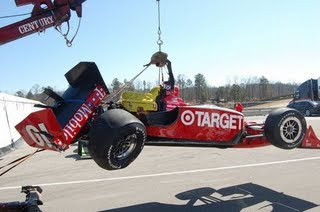 Finally broke its Duck with Justin Wilson’s second Indy Car victory last year at Watkins Glen, after a 25yr victory drought, and will be known as the only driver to win in 2009 besides Penske ‘N TCGR. Although Justin has now jumped to Team England, Err Dryer & Reinbold Racing, while DCR expects to have two full time entries, with hopefully Tomas “Rockem-Sockem” Scheckter and whom some are calling Captain America, nee J.R. Hildebrand at the controls. And yeah, I realize this story is lopsided, as where’s Darren “DangerMouse” Manning, buddy “Hot Rod” Rice, Townsend Bell, Arie Luyendyk Jr., etc. Not to mention that Ed Carpenter looks to be sitting on the sidelines, Hmm? Perhaps he could seek refuge at DCR? But Hey! Let’s get Ready to Rumble… As its almost time to go racing! Not to mention the barking of those fire breathing Honda powered Ethanol lumps being uncorked in Sweet Home Alabama… At Barber Motorsports Park, where a bunch of other drivers will participate with Princess this February 24-26 in preparations for the IndyCar Season Opener in Sao Paolo, Brazil on March 14th, which Y’all can watch on Versus with Bob Jenkins, Robbie Buhl and “Professor” Jon Beekhuis in the Announce Booth, while “LyndieCar,” (Lindy Thackston) Robbie ‘Purple Floyd ‘N BRUT Arute-Arute will potentially be trolling the Pit lane, albeit I’m not sure about the Sao Paolo race which probably will be a remote broadcast with just Messer Jack Arute on location? As I haven’t heard of any Airtimes yet.